Considered one of the finest sitar players to emerge on the Indian music scene, UK based Roopa Panesar is recognized as an emerging talent. Her soulful and unique style of playing has been receiving accolades from audiences and peers alike for her outstanding ability and quality of music, which has left her listeners captivated. For this performance, Roopa will collaborate with percussionist Pirashanna Thevaraiah and table player Nitin Mitta. 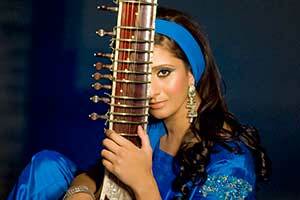 Included with your ticket to Roopa Panesar’s evening concert is a mid-day interactive workshop with Roopa. You will learn about Indian Classical music and how performing this style is a meditation. Please call the box office at (201) 684-7844 to register after purchasing your ticket.